It’s a scene that those of us who practice kundalini yoga know all too well: we’re holding our arms out to the sides, the burning sensation in our shoulders is increasing, our inner screaming match goes: ‘Drop the arms!’ ‘I will not!’ ‘Drop the arms!’ ‘I will not!’ It must be getting up to 30 (read: three) minutes in the posture by now, and it ain’t getting any easier. Welcome to tapas, kundalini yoga’s most notorious ingredient. So, what is tapas, and why does it feature so strongly in kundalini yoga? In the Vedic days, around 1,500 BCE in northern India, there was a huge focus on ritual. Ritual maintained the cosmic order of things. It brought the rains, it placated the gods, it generated prosperity and harmony. The central aspect of this ritual was a fire, aka Agni. Also an important and revered Vedic god, Agni generated tapas, or heat, which, like the sun, sustained life. However, this tapas / heat (as anyone who’s been sunburnt before will know) is also destructive. And in destroying things like demons, the tapas was purificatory. Therefore, all the implements that were used in the Vedic rituals were first cleansed by Agni’s tapas to clear them of rakshasas, or demons. As time wore on, the Agni ritual became internalised. Initiates started to generate an internal fire to purify themselves. 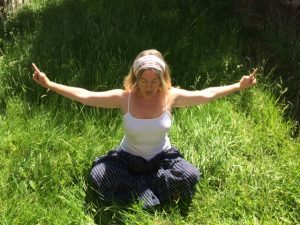 They did this through self-imposed austerities such as fasting, pranayama and physical challenges like holding their arms in the air for years at a time (let alone three minutes!). Anything that generated a symbolic burning purified the body of not only rakshasas but also karmas, or sins. The body was symbolically consumed by the heat of asceticism to purify it. That’s how tapas made its way into early forms of yoga, and why tapas plays such a strong role in kundalini yoga practices. It’s purifying us, singeing away our karmas, clearing out the rakshasas. I’m reminded strongly of tapas during kriyas such as the Meditation to Conquer and Burn Out Inner Anger. This is a particularly burny one, and hey, it’s even calling out its tapas in the title. Tapas is an essential ingredient in kundalini yoga because it clears our karmas, and according to the ancient rishis in India, it’s the route to liberation. Think of that next time you’re holding your arms in the air for three/30 minutes!